Back in January when I was pondering the feasibility of a South American moto adventure, for all the legitimate arguments against it (i.e. 22 career miles on a dual sport bike), there was one decidedly compelling reason that gave me confidence a-plenty. Logistically and financially, my ace in the hole was several decades of backpacking experience combined with two closets filled with lightweight compact gear. My armada of outdoor equipment and clothing was perfectly suited for the needs of the adventure motorcyclist. And with only six weeks between the day I made the final decision to do the trip and the evening of my departing flight, this proved to be an important edge. My gear and outerwear have seen many a backcountry mile, and I have no hesitation in recommending every piece on this list. Furthermore, because of the invaluable advice I received from the folks at Atomic-Moto, I can say the same thing about the riding gear. Miscellaneous: Therma-Rest repair kit, headlamp, matches, lighter, fire starter, multi-tool, pack towel, duct tape, 80 ft. paracord, ground tarp. Miscellaneous: 4 pairs of socks, 4 pairs of underwear, 4 short sleeve shirts, 2 long sleeve shirts, Keen sandals, 1 pair jeans, 2 pairs shorts. Tent, sleeping bag, pad, ground tarp, stove, cookset, camp chair, and trail shoes all fit nicely into one of the KLR’s 30 liter panniers. The other pannier held the bike-related stuff, such as the extra chain, sprockets, spare tubes, tire spoons, lube, oil, fuel bottle. All clothes went into the Firstgear Torrent 70L dry bag. 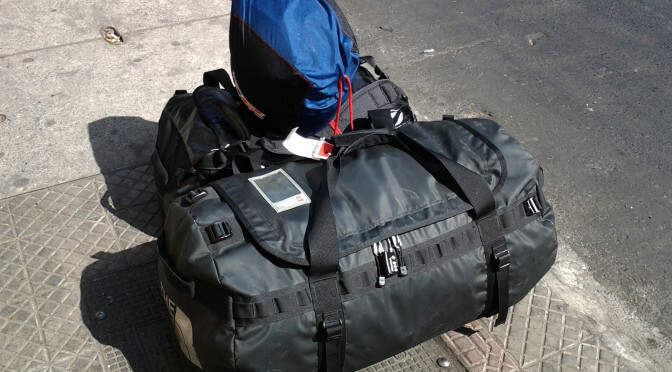 Camera, tablet, maps, road snacks and water bottle went into the tank bag.